AQHA Racing Champion The Fiscal Cliff arrived to Bob Moore Farms near Norman, Oklahoma today. He will start his stallion career in 2019. NORMAN, OK—AUGUST 22, 2018—AQHA Racing Champion The Fiscal Cliff SI 109 has been retired from racing and will enter stud at Bob Moore Farms near Norman, Oklahoma. His 2019 fee has been set at $2,750 and his foals will be eligible to participate in the Oklahoma-Bred and Black Gold programs. "It is with much excitement that we announce the addition of AQHA Racing Champion The Fiscal Cliff to our stallion battery," Bob Moore Farms General Manager Phillip Stewart said today. "He has an impeccable pedigree and was impressive on the racetrack. Stop by and take a look at him, we think you’ll agree he is a striking individual." The 13-time black-type winner is the only champion by leading sire Pyc Paint Your Wagon. 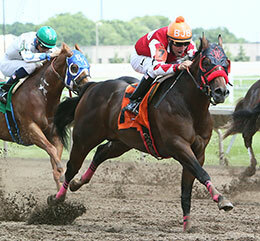 He raced most of his career for owner-breeder Thomas Lepic before being purchased by Whitmire Ranch last fall. Conditioned by trainer Kasey Willis, the 2017 AQHA Racing Champion Aged Stallion finished in the money in 22 of 26 starts with career earnings of $580,425. The Fiscal Cliff's biggest win came in the 2017 $345,000 Grade 1 Bank of Challenge Championship at Prairie Meadows, which he won by one-length over such runners as Ajs High, Rockin Disco and Mr Pyc To You. He was second in the Eastex Stakes(G2), Iowa Double Gold Derby [R]. Ruidoso Derby Challenge, and third in the Prairie Meadows Championship Challenge(G2), and Keokuk Stakes(G3). He was also a finalist in Champion of Champions Stakes(G1), and Higheasterjet Handicap(G3). The Fiscal Cliff winning the Bank of America Canterbury Park Challenge Championship in 2017. The Fiscal Cliff is the leading money earner by his sire, Grade 1 winner Pyc Paint Your Wagon SI 107, who has sired 100 stakes winners and earners of more than $31 million including Champion of Champions winner Mr Pyc To You SI 97 ($473,686)Remington Park Oklahoma-Bred Futurity winner Im A Fancy Pyc SI 92 ($454,765) and Heritage Place Derby(G3) winner Pyc Fun N Fancy SI 105 ($447,694 to 3, 2018). His dam is the multiple Grade 1 producing Shazoom mare Signs Zoomer SI 98 ($30,044-G2 finalist), dam of 7 ROM winners including Champion The Fiscal Cliff SI 109 (see above), stakes winner and third-place finisher in the Grade 1 All American Derby Wagon Tales SI 99 ($427,579), etc. 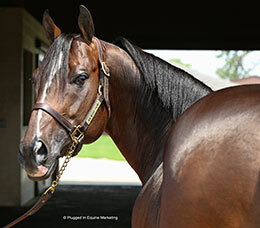 The second dam, Stylish Sign SI 98 by Vital Sign, is the dam of 10 winners, 3 black type including the aforementioned Champion of Champions(G1) winner Mr Pyc To You SI 97 ($473,686), Oklahoma Futurity(G2) winner First Painted Sign SI 104 ($284,911), stakes winner Second Painted Sign SI 102 ($104,604), etc. She is the granddam of Ruidoso Futurity(G1) winner First Valiant Sign ($1,053,844), Oklahoma-bred Derby(RG3) winner and G1-placed A Tres Of Paint SI 98 ($509,184), Hobbs America Derby(G3) winner Apollitical Sign SI 94 ($138,173), stakes-placed Df Apollitical Sign SI 99 ($38,392 to 3, 2018), etc. For additional information or breeding contracts call Phillip Stewart at 405-329-8571.